Oneida County Executive Anthony J. Picente, Jr.
First, you must know that Mr. Picente is on #NoHospitalDowntown's list of those who Support A Very Destructive Downtown Utica Hospital District. Picente is ignoring Regular Upstate Train Derailments, and facts surrounding the risks. Follow as #NoHospitalDowntown tracks derailments across the country and state. Is a downtown hospital part of another new position Mr. Picente is heading-up? Learn about the New York State Sports & Entertainment Facilities Association. 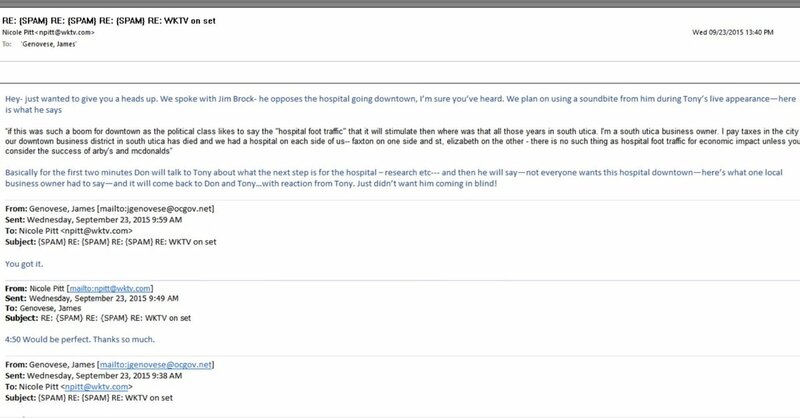 Media Helps Oneida County Executive - In #emailgate we learned that the media offers very specific, pre-interview coaching, to County Executive Picente, tips so he can combat a question from a constituent regarding the downtown hospital. Is this common practice? You'll also hear comments regarding; a Utica #Nexus Center, the Utica #AUD, and proposed Utica U-District. March 2, 2017 - Did you catch the County Executive Anthony J. Picente, Jr.'s 2017 State of County Address and media reactions? Where on earth will everyone park; AUD, Gun Club, Casino, Beer Museum & Incubator, more Office Space? He even said and included words "arts district". Really? The AUD is not part of Utica's arts district, so where's the kitchen sink? What about a "History District" too? Nah, seems there's no room for Oneida County History with this executive, consider: Oneida County History: Furgit Abot It!. So is more government, and a government-built museum a good follow-up to nano? Nano that's not yet happened - and that's after over 15 years? He'd bulldoze 34 acres for a 5th, inner-city, hospital district and then add a beer museum? Seems a beer museum is already in place, or should atleast be built in Utica's Brewery District near our brewery, right?